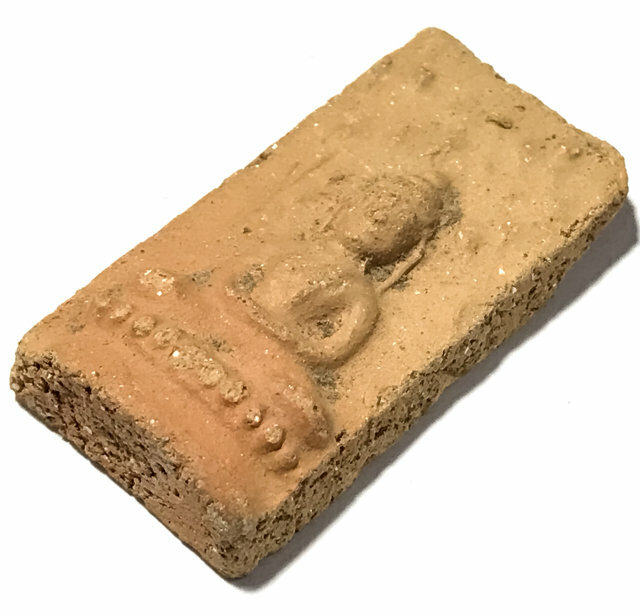 Pra Prok Po (Pim Yai) Pim Po Yao Lang Yant Phetcharat Pu Ta Nu Sa Dti Na Ma Pa Ta A - Sakyamuni Buddha on Bodhi Tree Throne with Falling Leaves - Sacred Ancient Clay Hiding Place Amulet from the year 2499 BE, with the Yant Paetcharat on rear face from Por Tan Jerm, of Wat Hoi Rak in Nakorn Sri Tammarat. 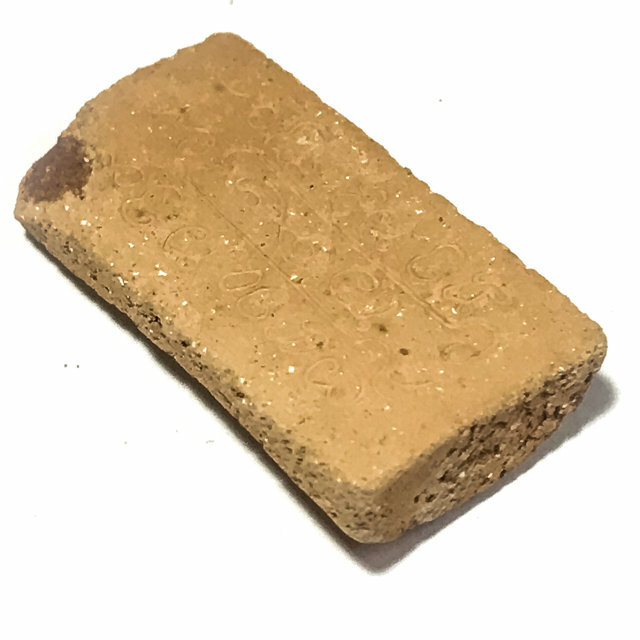 This Pra Prok Po ancient hiding place amulet (Pra Gru) is full of sacred power, and it is very apparent in its very rich appearance, for the time, effort and great assortment of sacred powders that have been gathered and mixed into this now more than half a Century old miraculous amulet. 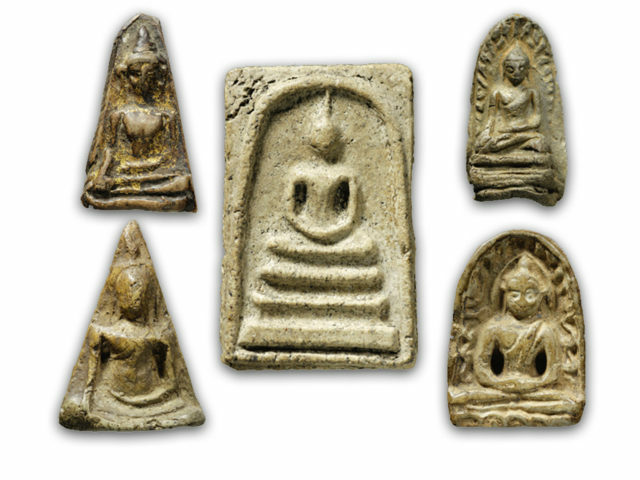 These are amongst the most classic Amulets that have graced international ancient amulet collectors seen during the last decade and have been considerably valued by Devotees around South East Asia for at least 10 years or more. The sacred value goes without question, and the trajectories and purity of their maker Por Tan Jerm, is that of a great Buddhist master of high repute. 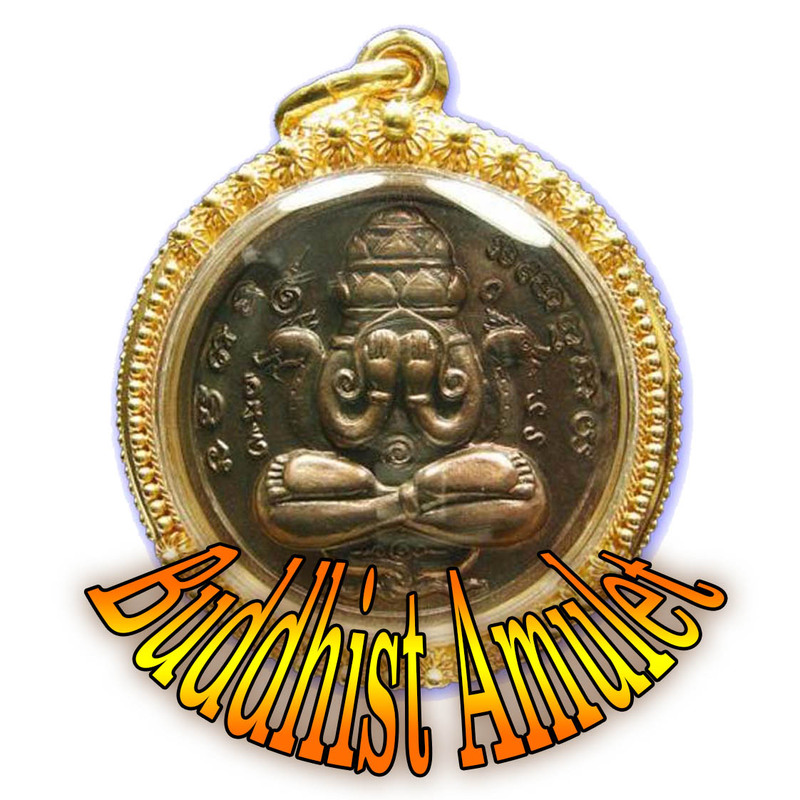 His amulets are amongst the most highly praised within this class and price range of ancient Buddhist Amulets. The amulet has clear features and detailed relief, and possesses all of the major characteristics of a Pim Niyom preferred model, with no flaws or missing points of reference, and all the important 'Dtamni' (authentication points) present within the 'Nuea Ha' (visual content). 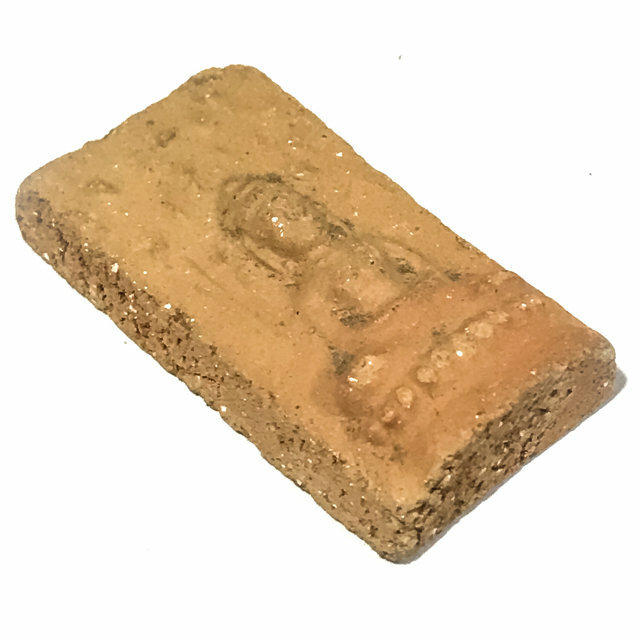 Pra Prok Po Lang Maha Yant (Buddha with Bodhi leaf Canopy with Maha Yant Phetcharat on rear face) 2499 BE is one of a small number of now ever rarer and highly regarded ancient Pra Kru Clay Hiding Place amulets. Por Tahn Jerm (Pra Tayn Jan) is one who is very skilled in the Witayakom occult sciences has summoned the Prai Samut and through supreme meditative absorption has commanded it to bestow its great power into these ancient Buddha amulets. 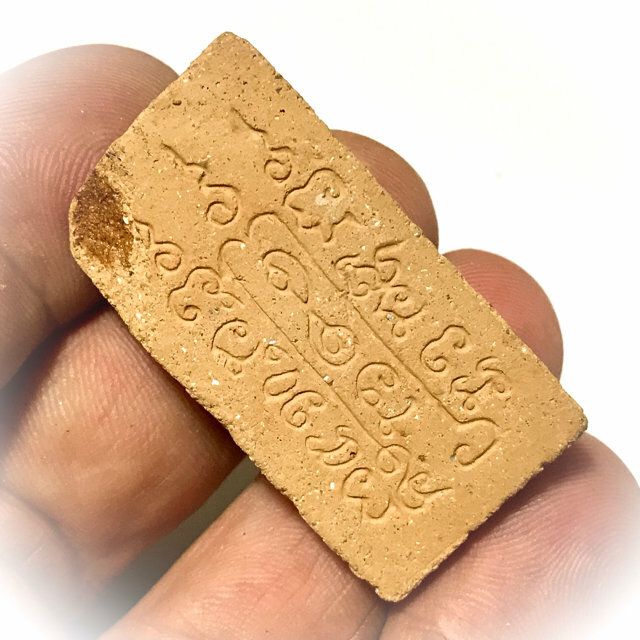 These amulets were created over a painstakingly long time of 10 years with many adept masters lending their powerful knowledge into the recitation of the necessary incantations for these Pra Gru. Formulated with a Sacred Muan Sarn of Pong Prai Samutra Saiyasart Powders and 108 sacred herbs baked clay mixture. 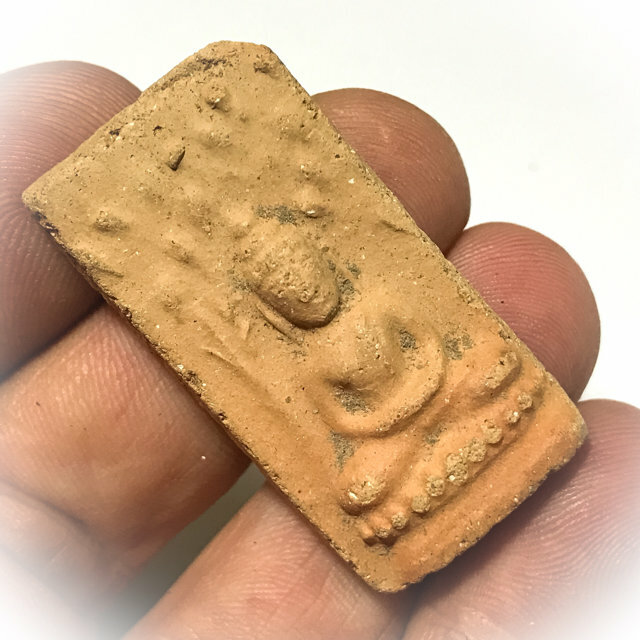 The intent of constructing these particular amulets was done in great compassion with the foresight that they would one day help to disseminate the Buddha Dhamma over the entire expanse of the world. The auspicious Pra Bpok Po and Pra Pidta Maha Ud Pra Gru ancient amulets from Wat Hoi Rak Bpak Phanang, Nakhon Si Thammarat, are truly created from a highly skilled master, who has gone above and beyond, to collect the most holy of ingredients. These were gathered, to form these highly auspicious and superbly powerful amulets that were consecrated with sacred incantations through supreme conscious awareness. 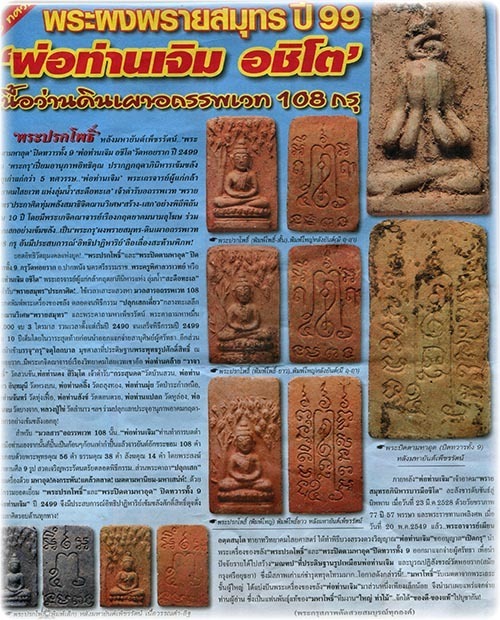 The Prai Samut and Pra Kata Maha Phetcharat was intoned 10,000 times during 3 Dtraimas. beginning in the year 2490 BE. The rite was completed in 2499 BE, before being able to distribute these amulets to the disciples of Por Tahn Jerm. and adherents of the Buddha Dhamma, which immediately reinvigorated the faithful. The amulets that weren't distributed were then taken and hiden away in the pavillion which houses the central Buddha image of the temple. Wat Hoi Rak has a rich history of adept Gaeji Ajarn skilled in the Khmer Saiwaet occultism including (but not limited to) Por Klaai Waajaasit, Por Kling, Por Mui, etc. who all had come enmass to lend their knowledge and expertise into the consecration of the holy muan sarn powder mixture.Por Jerm and the plethora of monks and Ajarn worked to manually grind the sacred powder by hand using mortar and pestle to a fine chrystaline with which the powder was used to inscribe sacred Yant and Kata Akom of 108 Pra Puttakhun, 56 Dtammakhun, and 14 Sagkhakhun. The ceremony was recited over by those who had undertaken at least 9 Sila roop moral precepts and the prayer of homage to the triple gem Ratana Sutta was recited during the entire rite. The amulets were consecrated with the powers of Kong Krapan invincibility, Klaew Klad evasion, Metta Maha Niyom and Maha Sanaeh. The Pra Prok Po and Pra Pidta are truly a miraculously powerful example of the highly prestigious physic power of Por Jerm that commands honour on every side. Later on LP Jerm master of the Aakom Prai Samut passed away from old age entering Nibbana at the age of 77 on 23 March 2528 having completed 57 Pansaa rains retreats. Pra Ajarn Peunotdtu Dtasunadtoh having inherited the masters Wittayaakom Saiyasart, performed the ceremony of worshiping the sol of LP Jerm to ask permission to open the amulet cache and remove them from the Montob, to be anointed and restored. Many of the amulets were broken and very worn out and with permission were restored and distributed to those whose Karma allowed them to receive such a rare piece of Buddhist and Saiyasart power and history.